London is a hectic place. Normally filled with more traffic and pedestrians than seems humanly possible, people crammed this close together tend to get edgy. What if a terrifying virus got unleashed that turns the inhabitants of the UK into rage fuelled running zombie monsters known as the ‘infected’? 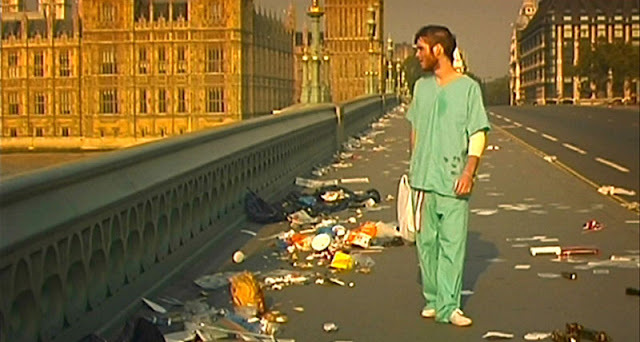 Before imagining the UK as a green and pleasant isle of wonder for the opening ceremony of the London Olympics, Danny Boyle cleared the streets of London to envisage a truly shocking zombie apocalypse. Recently roused from a coma, bicycle courier Jim (Cillian Murphy) checks himself out of a deserted hospital and finds London completely empty. The bustle of the city is dead, left only with an eerie stillness. This is what London will look like when the apocalypse comes. Desolate, forsaken and forgotten. The survivors are hiding out of sight. The Infected appear from nowhere like rabid dogs intent only on attack. The film later has Jim and other survivors shop in empty supermarkets and travel down empty motorways all in search of an army base that promises hope. But when the world goes to hell, is it really the army we should be turning to for help? John Murphy’s entire soundtrack is a master class in atmospheric horror scoring, but as all hell breaks loose at the climax of 28 Days Later, his In the House, In a Heartbeat climbs to an explosive crescendo over six minutes of beautifully shot, visceral violence. Our three surviving characters (a man, a woman and a teen girl) have dodged death at the hands of rage infected super-zombies, only to find themselves in the ‘safety’ of an army base populated by aggressive male soldiers who have a scary attitude to women. As hero Jim escapes the soldiers’ clutches and begins a rage-fuelled rampage with the help of some unleashed Infected, Murphy’s music builds and builds; quiet and calm at first with just two piano notes, then joined by mounting acoustic guitars and climaxing with drums crashing, electric guitar pounding and the visuals on screen becoming more and more terrifying as the deadly mixture of frightened soldiers, vicious Infected and one angry protagonist face off in the confines of the dark mansion. This is music to gouge out eyes to.